Hi friends! Today I wanted to share my Pretty Valentine’s Day Cocoa Station & Coffee Bar! The weather is quickly getting warmer over here in Texas, and spring is right around the corner. But spring is quite rainy and gloomy here which is still the perfect weather for a yummy mug of hot cocoa! I have such good memories of being a kid and coming in from playing in the cold outside in the winter, and Mom would have 2 huge pots of hot drinks waiting on the stove! One with apple cider, and one with hot cocoa! We always had those little marshmallows on hand, both the regular ones and the fun pastel ones. 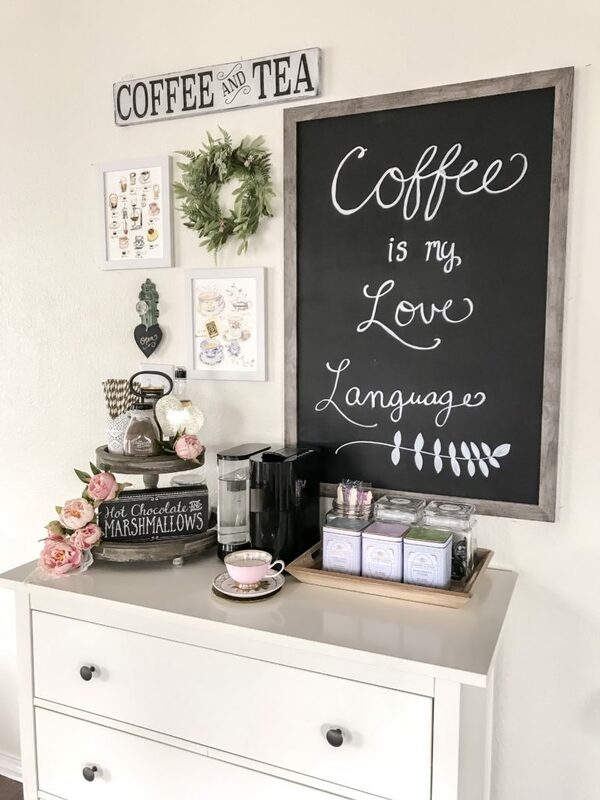 Cocoa was a staple drink for my mom (since she never drank coffee, I think she drinks tea now instead) and I quickly became obsessed with starting my day with a cup of cocoa too! 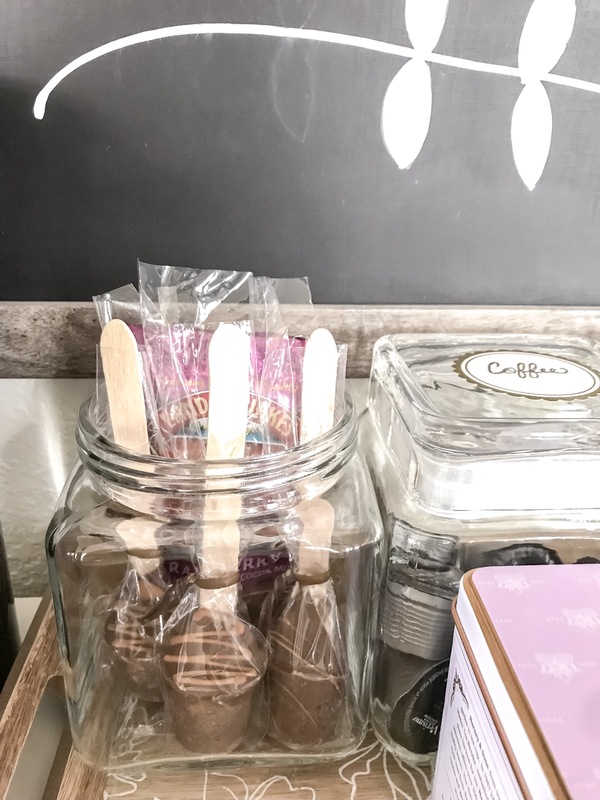 Creating a special little routine like that is such a fun and easy thing to do, and adds just that extra dash of magic to your daily routine! I always have this little coffee bar set up, and it has totally served us well every day. 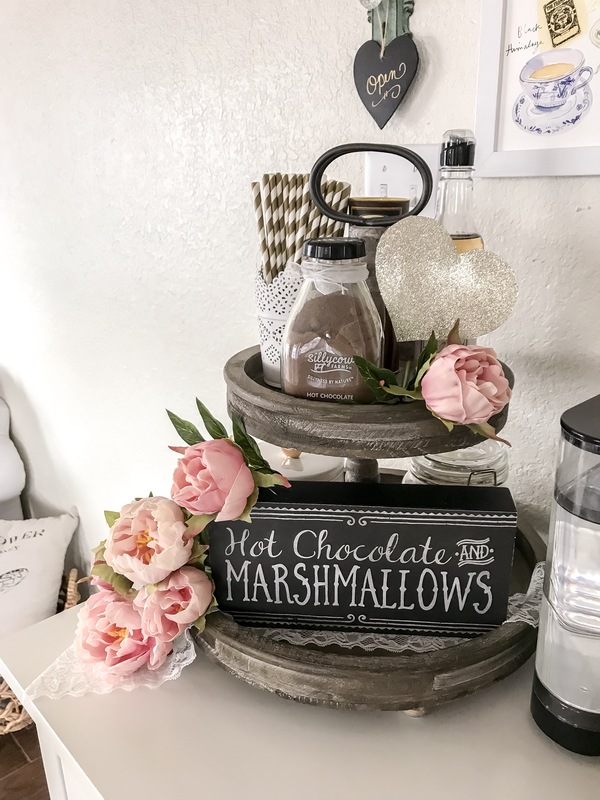 It’s so fun to give little updates to it for each new season, and I wanted to set up my tiered tray with a hot cocoa bar this time! The look I was going for is very romantic and glam, with lots of pink for Valentine’s Day. 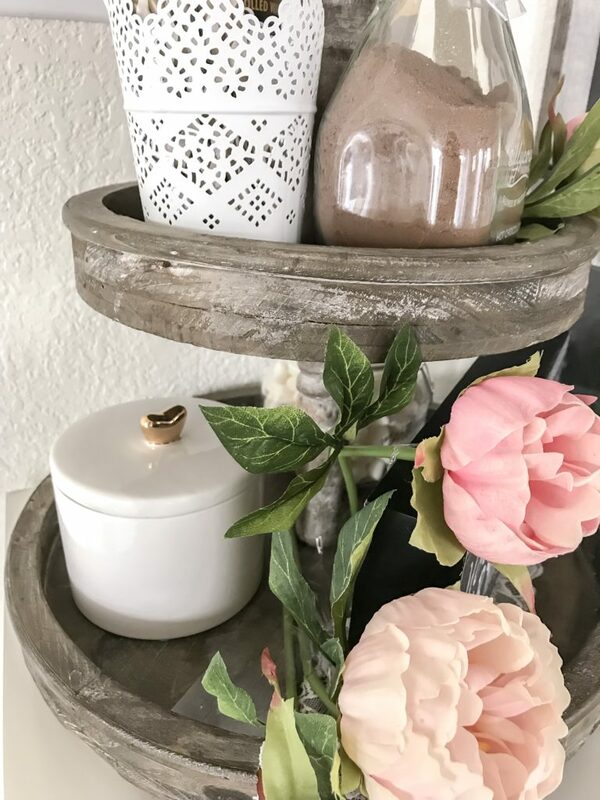 Tiered trays are so much fun to style! 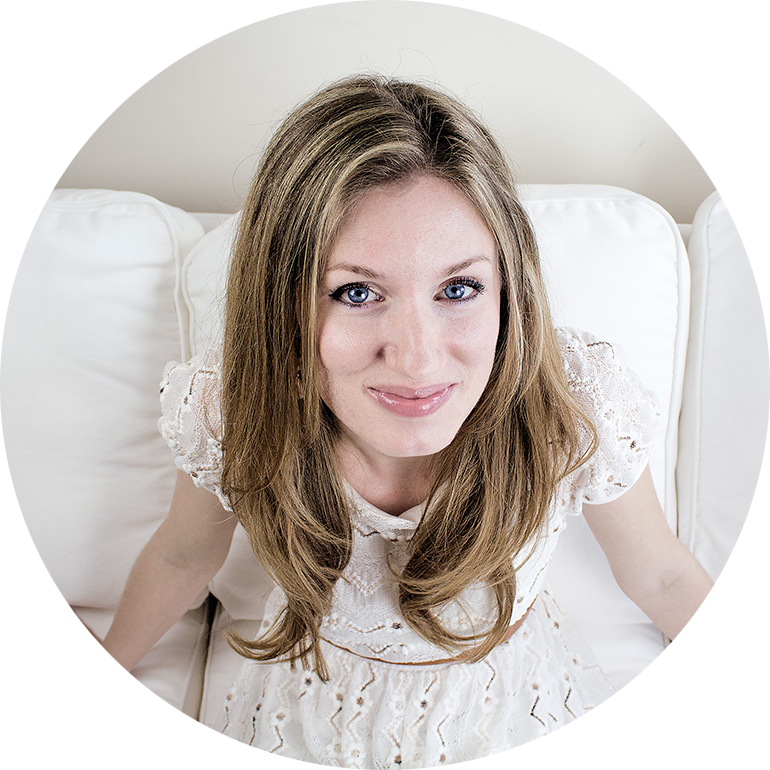 I have the faux peonies sort of spilling over the side organically, with a touch of lace ribbon. 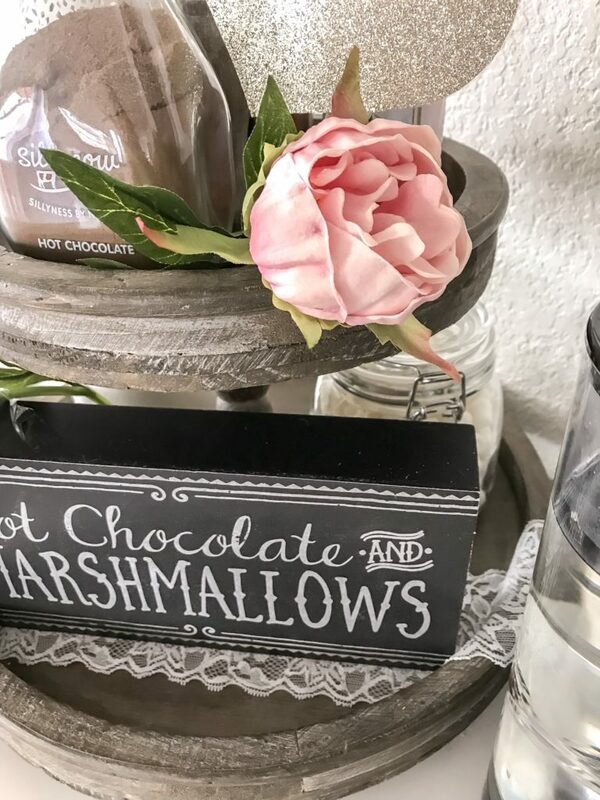 How cute is this little sign I got from Hobby Lobby? 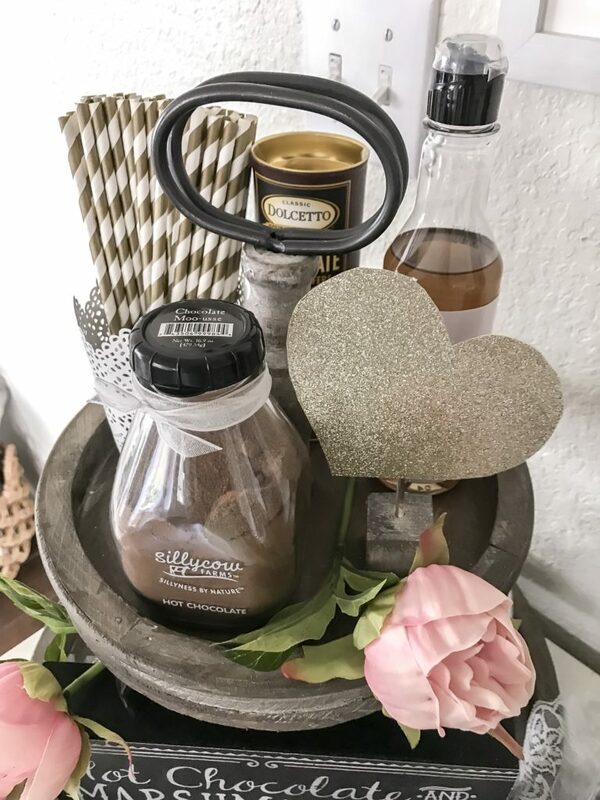 On the top here, we have gold striped paper straws, some cookie straws in the back, vanilla syrup (for coffee) a paper heart I DIYed, and of course cocoa! 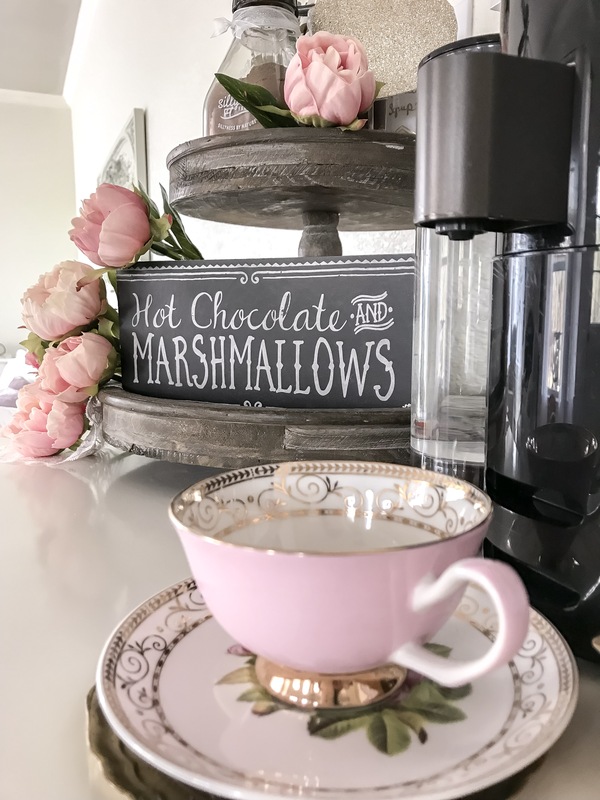 I found this hot chocolate mix that only has a few real ingredients, which I was so happy to find and it is so yummy! It came in the cutest glass jar too. Isn’t that the cutest name? Sillycow farms, haha! Just peeking around the corner there, are the marshmallows. 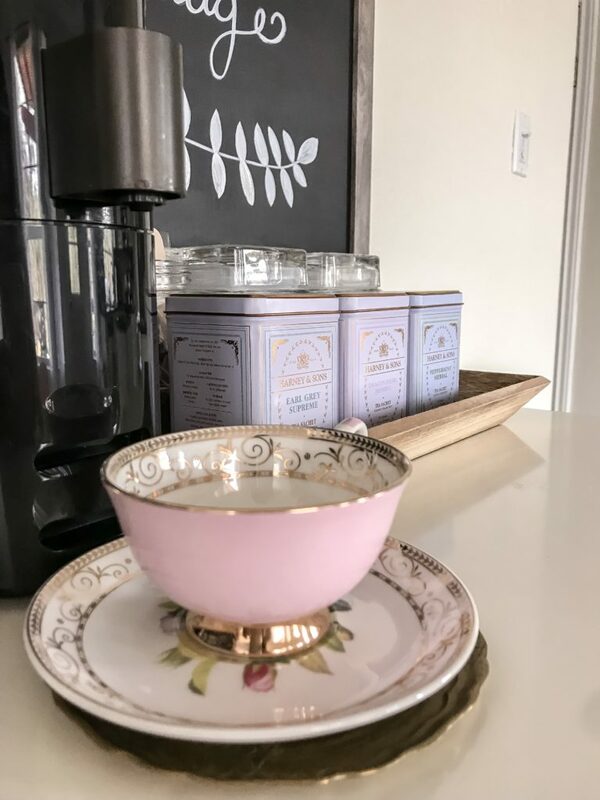 I love this pretty pink teacup I found at HomeGoods! I actually can’t keep it up here all the time since Milo would definitely break it, but I thought it was so pretty styled like this. Here we have some salted caramel cocoa stirrer spoons, that you just have to stir into hot water. And some packets of raspberry cocoa in the back. We have lots of options! 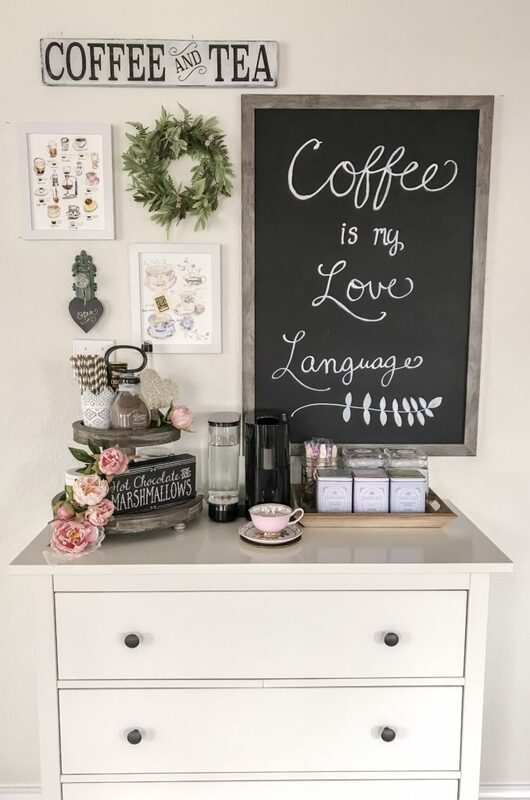 Coffee and tea anyone? 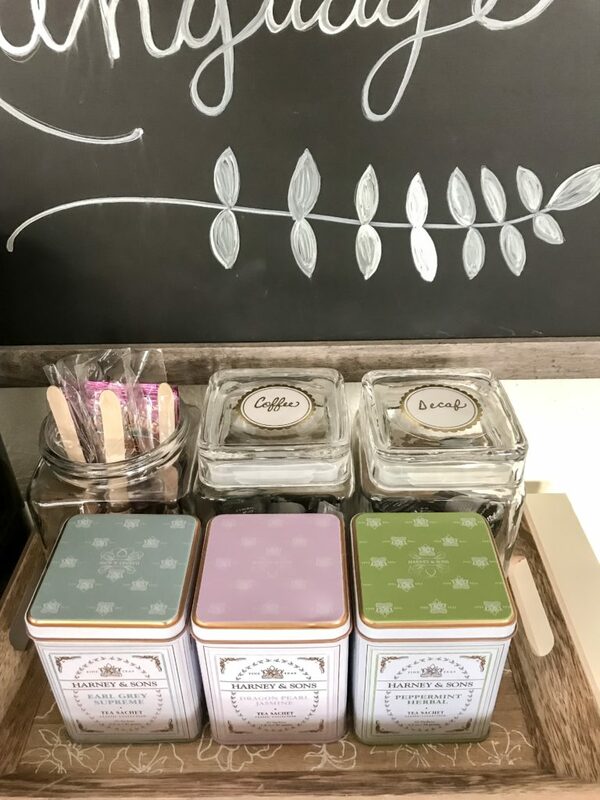 I am sooo in love with the Harney & Sons tea tins, I LOVE things in cute packaging so I can also display them as decorative accents! Love the pastels and gold. And there she is in all her glory! All the signs and prints have stayed the same since I set this up, you can find all the details on them in my Paris Cafe Inspired Coffee Bar post here. I did add a new little spring wreath from Michaels. 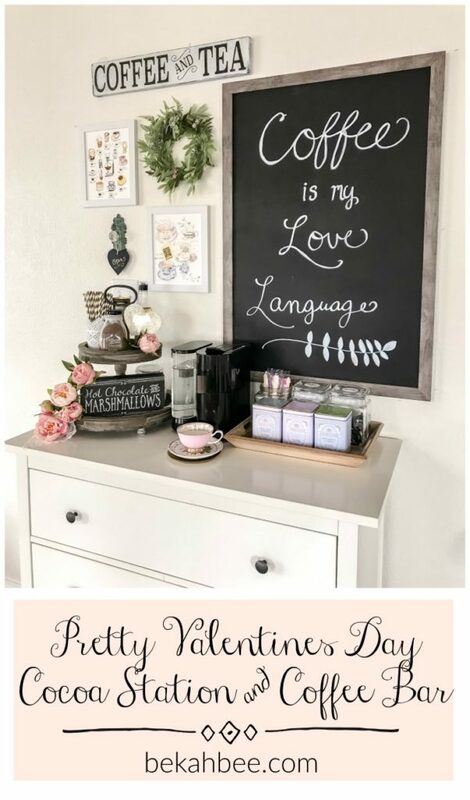 This entry was posted in Decor on 02/07/2019 by bekah.